I've had several friends ask me recently how I taught my son to read. Each of these friends has either a 3 or 4-year old who already knows the alphabet and letter sounds. To them, and many others, the idea of teaching a child to read can be very intimidating. However, you don't need an advanced degree or even an education degree to teach a child how to read. I'm no reading specialist or expert by any means, but I did teach first grade for a short time, taught my 4-yr old how to read, am currently teaching my 3-yr old to read and have attended several conferences on reading strategies. Below are some of my suggestions for bridging the gap between letter sounds and reading. In my opinion, this is the single most important part of teaching a child to read. If your child is bored with whatever he is reading, then he will have no motivation to comprehend the text, read fluently, or progress. Figure out what it is your child loves to read about and head out to the library. The beauty of teaching your child to read at home is that you don't need a textbook, all you need are books. Reading textbooks are beneficial for classroom teachers who have to teach a wide variety of students on varying levels. But homeschool parents working with their children individually, can find books at their child's exact level that get him excited about reading. There are plenty of leveled (beginner, intermediate, advanced) books that appeal to all readers. My boys like Cars and Star Wars, and I have found easy and intermediate readers at the library about both. Five to ten minutes per day (or a few times a week) is plenty for a 3 or 4-yr old. If you notice that your child is becoming frustrated, then it's time to stop and continue another day. The last thing you want is for your child to dislike reading or to create a mental block. The goal is to build confidence and a love for reading. --After we have gone over all the short vowels, we move on to blends and digraphs (th, sh, ch, pl, pr, sp, etc.) with short vowels. --Next I introduce long vowels with silent e. We do many activities (some listed below) comparing short and long vowel words. Once my son has mastered the silent e pattern, then we will look at long vowel diphthongs: ai, ea, ee, oa. --From the long vowel diphthongs we move to more complex diphthongs: oo, ou, ow, etc. --Finally we study the more complex word families: ight, ough, etc. --The whole time we are reading, reading, reading every day. Listed below are some of the reading strategies I use to teach the skills listed above. Phonemic awareness is the ability to distinguish and manipulate the individual sounds in a word. It is important in building reading comprehension and fluency and learning to spell. --This is a great car or dinnertime activity. Ask your child, "What sound do you hear at the beginning of cat?" or "What sound do you hear at the end of cup?" or "What sound do you hear in the middle of rip?" --At the dinner table, you could have your children take turns naming the first letter in each item on their plate. --Take turns thinking of how many words can you think of that start with a certain letter. --Play the animal game. Think of an animal, then announce, "I'm thinking of an animal that starts with the letter ___." Children take turns guessing until someone guesses right. The person who guesses right gets to go next. --I cut out pictures from a Kidergarten skills workbook, laminated them, then arranged them into various sorts. For beginning or ending sound sorts, I found pictures that either began or ended with 3 different consonants and mixed them together (ex. T, W, S). Then I wrote each letter at the top of its own piece of paper. I gave the pile of pictures to my son and explained to him to place them on the correct paper according to the beginning sound (or ending, depending on which one we were working on). --I did the same thing for short and long vowel sorts. When we're studying short vowels, I have my son sort "a" from "o", "i" from "e", and so on. When we've moved on to long vowels, we will sort short "a" from long "a", etc. --I use magnetic letters and it goes like this, "Find the letters to make CAT, /c/ /a/ /t/. Great, now change cat to bat. Change the bat to sat. Now make the sat sad. Great, now make sad into sod." You get the idea. --As your child's level increases, you can increase the difficulty, adding in digraphs and blends (th, ch, pl, br, etc. ), then eventually long vowels. "Find the letters to make RAT, now make rat into rate. Now make rate say late. Change late to slate. Make that slate say slat." Sight words are the most common English words in print. Many of them are words that do not follow the normal rules of phonics. Therefore, they cannot be sounded out, and must be memorized. Ex. the, have, of. 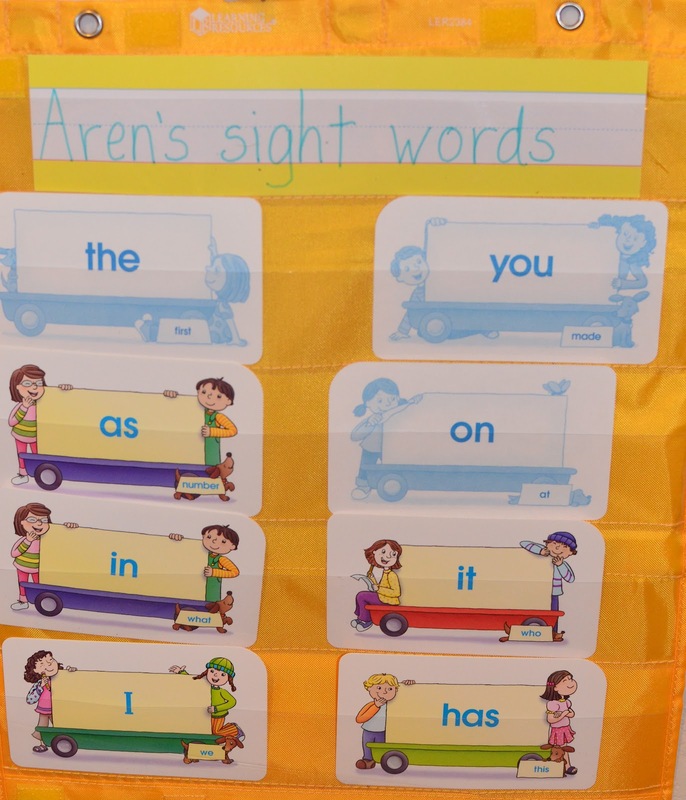 Here is a website with lists and printables of sight words. --Start simple by only introducing two to three per week. Begin with easier words like, "I, it, if, on, in." 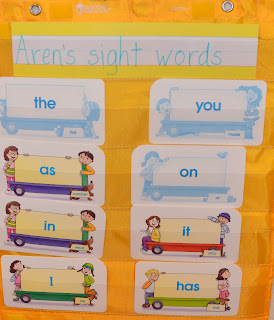 --Have sight words displayed on a wall (I use a pocket chart). Once the words have been introduced, have your child point to the words as you say them. Then have your child read the words as you point to them. --As you read books to your child, have him/her read the sight words as you come to them. Have him/her count how many he/she can find in one book. --Play sight word games, such as memory match, bingo, or fishing. You can make an easy fishing game by placing a paperclip on each sight word paper and attaching a magnet to a small stick or wand. Word families are words that share the same ending. Easy examples of word families are words that end in -an, -at, or -ar. More complex word families are words that end in -ight, -ough, or -ation. Learning to sort and manipulate word families helps children to categorize, organize, and store phonemic information in their brain. It gives them a bank for figuring out words that they have not yet learned. --Have your child sort word families written on slips of paper. Ex: ow words that say, "ou" vs. ow words that say long "o" or ough words that say, "uff" vs. long "o". --Play the same manipulation game listed under phonemic awareness, but with word family chunks like "ing" words, "out" words, etc. An example is "Make fling, change to sing, change to spring, change to sprout, change to shout." --Make a train, parts of a race care, necklace or whatever you can think of that your child would enjoy. In the train example, the engine has beginning sound/blends and has to attach to word family endings to make words. --Tape beginning sounds and word family endings to legos, then attach the legos together to make words. --Write several different word families on fish shapes. Have a fish bowl for each family. The child then sorts the fish into the correct bowl. I have found that teaching a child to read is very similar to teaching so many other life skills, such as swimming or riding a bike. It's more about building confidence and becoming comfortable than it is about the actual skills. Sure, you have to learn how to kick your feet and move your arms to be able to swim, but you'll never get to that point if you're not comfortable putting your face in the water. The same is true with reading. It can be overwhelming and scary to a child. It is just as important to get your child comfortable with words and reading as it is to teach them phonics. In each circumstance of my oldest son learning to swim, ride his bike, and read, he had all the necessary skills but lacked the confidence to move forward and succeed. He knew how to swim, but was fearful of jumping in or swimming in the deep end. He could ride a balance bike perfectly, but was too scared to go fast enough on his pedal bike to be able have enough forward momentum to stay balanced. He understood phonics and how to read words, but lacked the confidence to read a beginner book. In each circumstance, at some point something clicked in his head, and it was like a switch turning on. He suddenly had confidence in his ability and took off at light speed. So then, how do you build confidence? --Start with early readers, like the Bob Books. My youngest son loves these! They start very simple and then increase in difficulty. With only a few simple words, even the earliest reader can make it through an entire book. My son was so proud to tell his daddy that he read an entire book by himself. We purchased these two sets of Bob Books from Amazon for around $10/set. Most libraries also carry them. --Gradually work up to simple, "real" books. Some of my favorites are Dr. Seuss' Hop on Pop, Ten Apples Up on Top, and Green Eggs and Ham. P. D. Eastman's Fred and Ted books, Go Dog Go, and Are You My Mother? are also great books for early readers. Read one page or one line and have your child read the next. Then it isn't so overwhelming. --Join reading programs from the local library or Book It. --Give lots and lots of praise and make a big deal about reading. Have your child call Grandma or an Aunt or someone to announce that he read an entire book by himself. After all, it is a BIG DEAL!!! I have read a decent amount of research that shows it is possible to teach a child to read in two languages at the same time. However, I prefer that my children become fluent readers in English before learning to read in Spanish. Reading in English is much more difficult than learning to read in Spanish. I feel it is better to master reading in the more difficult language first, then to move on to the easier of the two. Plus, our home is not a bilingual home; it is very English-dominant. Therefore all the vocabulary and background information my children have accumulated over the years is in English. Reading in English makes sense to them because they already know what the words mean. Good luck and please feel free to share success stories about your child learning to read! This is just what I needed, for my daughter! Thank you for putting it together!